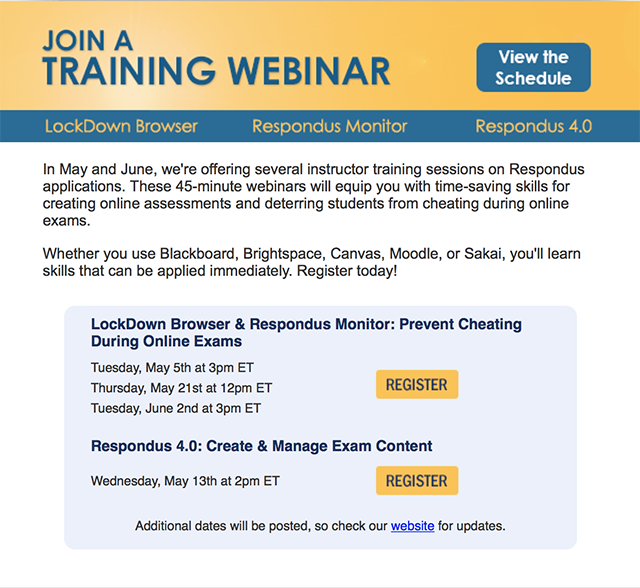 UPCOMING SESSIONS Introduction to the Respondus Test Bank Network Tuesday, September 1st at 3 pm ET Respondus 4.0: Instructor Training Wednesday, September 9th at 1 pm ET LockDown Browser & Respondus Monitor: Instructor Training Thursday, September 10th at 2 pm ET Tuesday, September 22nd at 3 pm ET View webinar details and register. New Respondus training opportunities are available. Find more information on our Webinar page.